Admit it. You&apos;re a little Kurios. This summer, get ready for the soaring and marvelous enchantment that a Cirque du Soleil production promises. The Quebec-based acrobatic and performing arts company will bring KURIOS: Cabinet of Curiosities to Fairfax County under the iconic blue-and-yellow Big Top tent at Lerner Town Square at Tysons II from July 21 through September 18, 2016. KURIOS: Cabinet of Curiosities, written and directed by Michel Laprise, is a tale in which time comes to a complete stop, transporting the audience inside a fantasy world where everything is possible. In this realm set in the latter half of the nineteenth century, reality is quite relative indeed as our perception of it is utterly transformed. 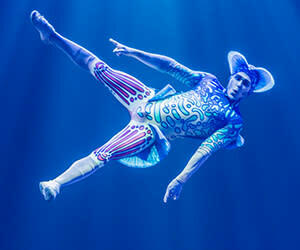 Browse special Cirque-related travel packages and dining offers below.